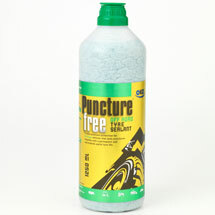 OKO offers its best-selling Off Road puncture sealant in a handy squeezable 1250ml bottle. This makes it an attractive retail product to sell in garden centres, garages, grasscutting dealers, mobility suppliers and plant supply & hire companies. OKO Off Road in bottles also appeals to golf courses, horticultural service operations and companies who run fork lifts and other rubber-tyred vehicles. Inner tubes are protected by OKO, and although tubes are less robust than tyres they will in most cases be sealed, so long as the tube is not badly torn or punctured right through both sides. 1250ml bottle will fill 2 tyres of many smaller vehicles, or 1 larger tyre. Check the dosage calculator on this page. The cap includes a valve core remover and a tube that allows the sealant to be squeezed easily into the tyre. OKO Off Road may be used on road at speeds of less than 80 km/hr (50 mph). WORKS WITH INNER TUBES and TUBELESS TYRES. QUANTITY REQUIRED: see the Dosage Calculator on this page.